Simon Gawesworth, world leading fly caster and fly line guru, is coming to Tasmania. 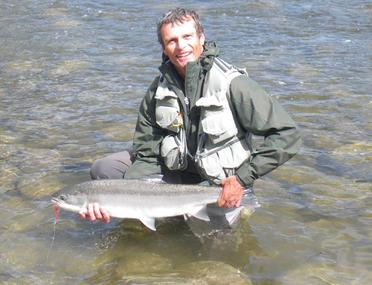 Simon is one of the world’s leading experts on fly lines and casting. As the leader of RIO’s line development team and chief marketer there are few people in the world with Simon’s knowledge of fly lines. A Pleasant Fly Fishing Evening – Friday 13 March. Simon will be at Clarendon, the home of the Australian Fly Fishing Museum, Friday 13 March, discussion casting, fly lines and fishing around the world. This will be an open discussion where you can ask questions of an expert panel, including Simon, Peter Morse, Peter Hayes, Rex Hunt and more. Have fun with lucky door prizes and a short auction, (of items including a Sage rod, wine, pictures, Wigram flies). Savouries will be served and drinks will be available from a bar. Time: 6.30 pm – 9.30 pm. Cost: $15. Pay on arrival. Booking and RSVP name to 0417 543 815 or email australianflyfishingmuseum@gmail.com. Free casting demos on the South Esk River at Clarendon. Refreshments available from the Clarendon Cafe, or bring your own picnic to enjoy on the banks of the South Esk River, or anywhere in the beautiful parkland surrounding Clarendon House. Venue for both events is Clarendon House, 234 Clarendon Station Road, Nile. Simon’s father taught him to fish at the age of 8 and he’s been teaching fly casting professionally since the age of 16. With over 35 years of teaching experience, Simon is a highly sought after instructor. He has written three books on Spey casting, details of which can be found on his site speyborn.com . He has both cast and fished for England in British, European and World Championships and was elected Captain of the England team for the 2003 World Fly Fishing Championship. Simon is acknowledged as one of the world’s leading authorities on spey casting and has taught and demonstrated spey casting around the world.